A domain-specific modelling language can be considered as a situationally focussed conceptual modelling language. A modelling language is typically underpinned by a meta-model that defines its abstract syntax, utilizes a notation (a.k.a. concrete syntax) and possesses a well-defined semantics, sometimes with an associated ontology. However, the relationships between models, meta-models, modelling languages and ontologies are not well defined in the literature. In particular, the implications of the strict meta-modelling paradigm fostered by the OMG in relation to the type/instance duality are often described in a vague and equivocal fashion. 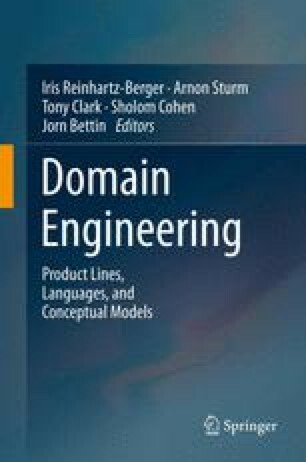 This chapter provides a solid theoretical foundation for the construction of domain-specific modelling languages that can help define both the abstract and concrete syntax aspects. Two example languages are described: ISO/IEC 24744 (Software Engineering Meta-model for Development Methodologies), a language that can be used to define software-intensive development methods; and FAML (FAME Agent-oriented Modelling Language), a language for the specification of agent-oriented software systems. We wish to thank Mats Lind and Haris Mouratidis for their comments on the FAML notation. BH-S also wishes to acknowledge the support of the Australian Research Council through grant DP0878172. This is contribution 12/01 of the Centre for Object Technology Applications and Research within the Human Centred Technology Design centre at the University of Technology, Sydney.